One evening, B and M (3 years, 1 month) decided to take everything off their kitchen shelf and put it into their backpacks. Plates, bowls and utensils jangled around loudly in their backpack as they hauled it around the house. When I announced storytime, they dropped everything in the hallway. Daddy stopped them and said, “You guys need to put everything away!” Mackenzie does as she’s told, with some help from me. Brooke, ever the rebellious one, refused. Mark is an amazing dad, but – like all of us – sometimes he doesn’t know what to do when the children don’t do what he asks. He asked first in a firm and respectful tone. Then he gave Brooke choices, “Do you want to go by yourself or do you want me to carry you?” She avoids looking at him, so he chooses for her and carries her to the kitchen. They stand in front of the kitchen shelf for a good five minutes where she still refuses to put things away, so he decides to give her ‘time-out’ on the couch. She somehow falls off the couch and starts screaming. Then I looked her in the eyes and told her the facts, “I’m going to read stories now. You can join us after you put away your dishes and utensils.” I added, “You don’t have to put anything away if you don’t want to, but then you won’t be able to read books with us tonight.” I wanted to convey this was her choice. I put her down and went back to the bedroom. I sat down next to M and started reading. B got into bed with us and tried to pull the book toward her so she can see it. I held the book close to my chest and said in a friendly tone, “You can join us for this story after you put away your dishes and utensils.” She doesn’t move. She tried to pull the book toward her a couple more times, but each time, I tell her the same thing. My tone was friendly, but my stance was firm. Finally, Mark came to ask her again. This time she got up, went to the kitchen and put everything away, with some of his help (see Collaborating With Your Child). When she was done, she ran back to the bedroom and joined us for story time. In this post, I talk about Montessori’s Three Stages of Obedience. Up to 3 years old, children are too young to be expected to obey. They have an inner directive that guides them, and their obedience is to that inner voice only. If they obeyed your request, it’s because it coincided with what they wanted to do. When it comes to cleaning up – if they are not readily willing – you can ask them to help, then hold their hand and model doing it with them by your side. Recently, my children have transitioned to the 2nd stage of obedience, where they want to obey, but can’t do it consistently. How do I know this? I’ve observed them doing what I ask more frequently, but still inconsistently. If you’ve notice your child being able to obey your requests more frequently, then you can make more requests, while continuing to offer collaboration. It is appropriate at this stage to provide logical consequences if they don’t do as you ask. Time-outs and other arbitrary punishments. What does sitting in the corner have to do with cleaning up? Nothing. A logical consequence is something that is directly related to what is happening. For us, we clean up before storytime, so it is sequentially logical: if you don’t clean up, you can’t join story time. If you throw a fork on the floor or leave the table, it means you are done eating. If you don’t get dressed, it means you can’t go out to play. These are logical consequences that make sense in the context of what is happening. If you understand the 3 Stages of Obedience, you will see that it is not personal. It is developmental. 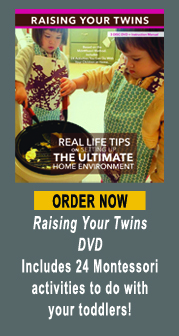 Your child is not being defiant on purpose, trying to make you angry, or being a bad kid. And you are not a bad parent! Their brain just hasn’t developed all the linkages it needs to follow your requests. Last words of advice: Choose your battles. Don’t insist on everything. When they get to 5, they will obey your requests much more readily. If you don’t get embroiled in power struggles with your toddler, you’ll enjoy the magic of 2s and 3s so much more! For the last two weeks, I’ve been observing in a classroom at a Montessori school. As a student, consultant and teacher-to-be, I learned a tremendous amount watching these 30 children between 2.5-6 years old. As a parent with two children just starting Montessori school, it was a revelation. B and M started school six weeks ago (they attend a different school than the one I observed at). They are the youngest in their class of 25 children. Until now, I’ve spent nearly every moment of their lives with them. Suddenly, they are gone for so many hours. I often wonder if they are too young to be in school for this long. My biggest worry came three weeks after school started, when they started getting extra clingy and needy at home. Even M, who was usually independent, started throwing herself on the floor and whining because she wanted me to pour the milk for her. That was unusual. I got some clue to what was happening when I started observing Jackson, the newest 3-year-old in the class. Watching him helped me realize what happens with young children in a mixed-age classroom: the older children love taking care of them. They don’t crowd them like adults do, but if the little ones show any sign of hesitation, the older ones will swoop in like little super-heroes and help. For a second, I thought maybe it wasn’t a good idea to have my children surrounded by so many older children, who were getting in the way of their independence…until I spent two hours observing what else Jackson was experiencing. The day starts with Jackson doing some knobbed puzzles (also known as cylinder blocks), which the teacher had shown him a couple days ago. He puts it back on the shelf and starts roaming around the room. He stops to watch 5-year-old Artie make bread, measuring out ingredients, pouring them into a bowl then kneading them with his hands. While the dough is rising, Artie starts cleaning. He gets the table crumber (a small dustpan and broom for the table). Jackson follows and gets the second table crumber. Artie starts sweeping and Jackson imitates him. Artie then fetches the dustpan and broom for the floor. Jackson does the same thing. Just as Jackson was about to sweep the table again, Artie says, “That’s for the floors. 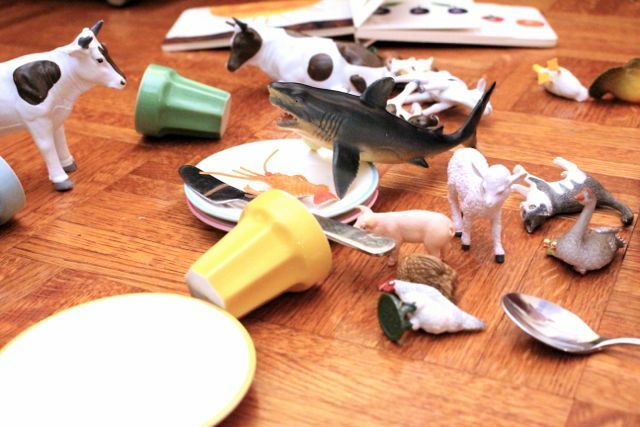 The crumber is for the table.” 3 year old’s aren’t always expressive, but I could’ve sworn a lightbulb went off. As Artie is waiting for the dough to rise, Jackson watches him do math for a bit, then decides to get snack – bananas, carrots and raisins in a box. He sits down to eat the raisins, but cannot get to the last couple. Olivia, a 4-year-old girl, goes over to help him take out the last couple. I don’t know how she noticed, but she did! Olivia sits down at her own table to do gluing. He finishes snack and comes to observe her. Music comes on for Walking On the Line. That’s a special Montessori activity where the teacher plays different kinds of music, and the children who participate can walk, skip, march, run or walk sideways along a line on the floor. The marching song comes on. Jackson starts marching in place. The next song comes on. Jackson starts running in place. They laugh. It was a funny moment only children understand. Later, another four-year-old, Anna, walks with him around the shelves pointing out the different activities: “You can open these (containers). This is bead stringing. You sit in this chair to comb your hair. This is the Russian doll. You need a mat to do this.” And then she goes to fetch a mat, rolls it out at a table and shows him how to take out each of the Russian dolls and how to put them back. A little while later, he goes to watch the teacher give four-year-old Henry a spelling lesson with the alphabet box. He watches as Henry spells ‘cat,’ ‘dad,’ ‘bird,’ ‘horse’, etc. – 11 words in total. All of this was followed by a birthday celebration for a 6-year-old complete with astronomy (how it takes one year for the earth to move around the sun), story-telling, poetry and song. In two short hours, I observed Jackson immersed in an environment with way more information than any adult could teach him. And with his ‘Absorbent Mind,’ he took it all in: from math, to spelling, to the procedures of making bread, to music, to art, to all the different activities available in the classroom, not to mention all the different children he interacted with. He experienced many activities he could do now and many others that were just 2 or 3 steps away from where he’s at now. This environment was rich, meaningful and, dare I say, perfect, for the development of this child. With all my training, even if I could do the same activities at home, I could not give them the richness that comes with all these mixed-age children. This morning, I dropped off B and M at school. I looked inside their classroom and saw these things: the same Montessori materials, equally well-trained teachers and 25 other children of varying ages. I breathed a sigh of relief. They’re getting a great education here and I could go off feeling relaxed and happy. I just came back from parent-teacher conference and found out that B and M do not whine at school at all. They are very independent and want to do everything themselves. So it’s just with Mom…*sigh*. The teacher, whose class I observed, was an incredibly patient human being, and I’ve been channeling her every day when necessary. I go back to the principles of Connection Before Correction, the 3 stages of obedience and general deep breaths. I’m not perfect, but I’m trying! 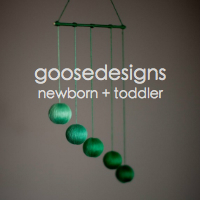 *Interested in setting up the perfect Montessori home environment for your little one(s)? Click here to find out more about my Private Consultation Services. Recently, I’ve been obsessively reading Montessori books. I came upon a whole chapter on discipline in The Discovery of the Child, which I loved. “One of the greatest difficulties in securing discipline lies in the fact that it cannot be obtained simply with words,” Montessori writes. Okay, so that’s the bad news. You can’t make a child do something just by telling him to do it. She writes, “To tell a child: ‘Stand still like me!’ does not enlighten him. One cannot by a simple command put order into the complex psycho-muscular system of a still growing individual.” Most of us think that if children aren’t doing what we ask because they are disobeying us, when in fact, most of the time, they are simply UNABLE to follow our commands. Their body and mind has not come together in such a way to be able to do what we ask, so our job then is to help them achieve this before expecting them to obey our commands. 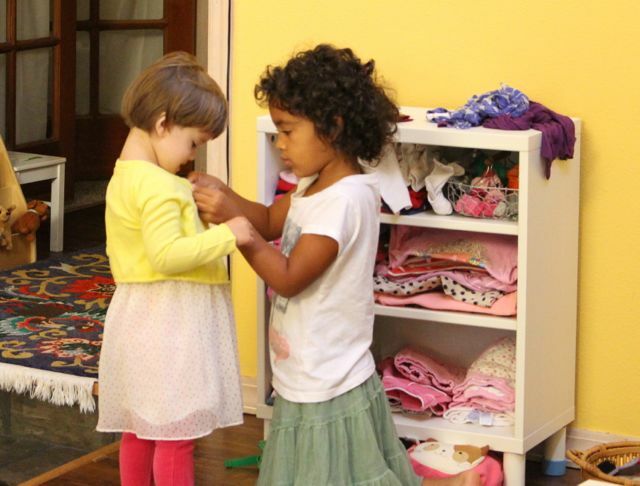 Montessori breaks down obedience into three stages. In the first stage, the child cannot obey you. 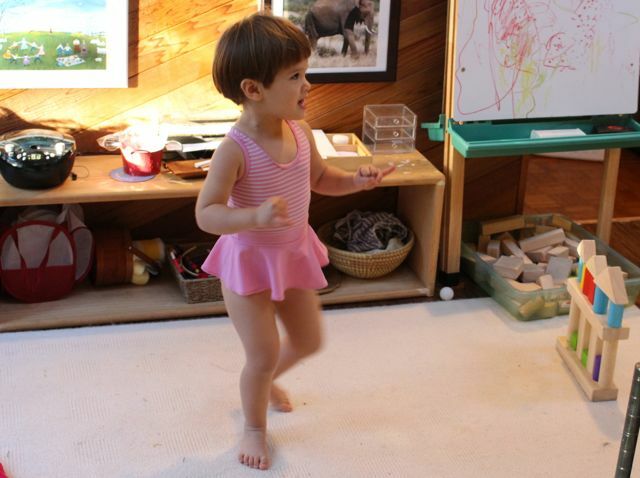 This child, usually between 0-2.5, is obeying the voice inside himself, you can also call it his ‘inner directive’ (if you know a toddler, then you know what she means). In the second stage, the child would like to obey and seems to understand your command and wishes to obey, but he cannot obey, or rather, he does not always succeed in obeying, even if he wants to. This stage starts from 2.5 and lasts till about 4.5-5 years old. In the third stage, the child has perfected his self-control and is able to do what you ask. This doesn’t mean he always will, but he is physically and emotionally capable of obeying. So before 5 years old, a child either cannot obey you or wants to but cannot do it well. How often do you yell at your 5-and-under because you think they’re being bad on purpose? Through work, the child is learning to bring together his body and mind, and through this process, he will achieve many things – one of which is being able to follow your commands. So what can you do to help your child get here faster? First, you need to observe your children closely and see what they are interested in. What do they like to do where they are not easily distracted? What tasks do they do with concentration and interest? Maybe they’re walking on that thin ledge on the sidewalk over and over. Maybe they’ve used up half the bottle of soap and still haven’t finished washing their hands. Maybe they’re putting on and taking off certain items of clothing over and over. Maybe they’re putting everything in their mouth and exploring. Well, until you’ve let them do those things over and over till they feel satisfied, getting them to do what you want them to do will be a struggle for you and them. The hardest part of this whole thing is not letting your own judgments get in the way. Maybe you don’t think their interest is worthy, maybe it’s very inconvenient for you to let them, maybe you have other concerns that tell you not to let them do those things. For example, it’s fall here in the Pacific NW and it is cold. But during this boots and jacket weather, Brooke (2 years 10 months old) spends more time putting on swimsuits than anything else. And it happens at the most inconvenient time. Like first thing in the morning when we are trying to get everyone out of the house by 730am. I’ve had to manhandle her out of her swimsuit into regular school clothes, with screams and tears, of course. She’s not interested in puzzles, learning her letters, painting or any of the myriad other activities I have out for her. No, she just wants to put on swimsuits – first the pink one, then the blue one, then the neon yellow one. And then all three, one on top of the other. It’s amazing how much time and concentration she spends on doing this everyday. So this is what I decided to do. On our work shelf, I created an activity called ‘going swimming.’ It includes everything you would need to go swimming, from swimsuits, t-shirts, shorts, flip flops, sunglasses, towels to tote bag. This is by far her favorite activity and four days later of almost nothing but changing into and out of swimsuits, there’s much less struggle getting ready in the mornings now. She even says to M, “We can’t put on swimsuits now because it’s for after school.” So much can get in the way in the mornings, but I’m happy swimsuits is no longer one of those things. What’s the bigger lesson in all of this? Trust your children. Follow their lead. Life will be so much easier. 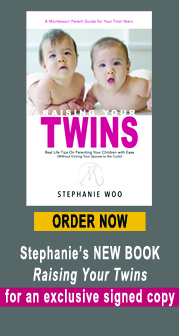 ** Register for Stephanie’s next Toddler Course: Real Life Tools To Parent Your 1-Year-Old and 2-Year-Old With Ease! Find out more here.